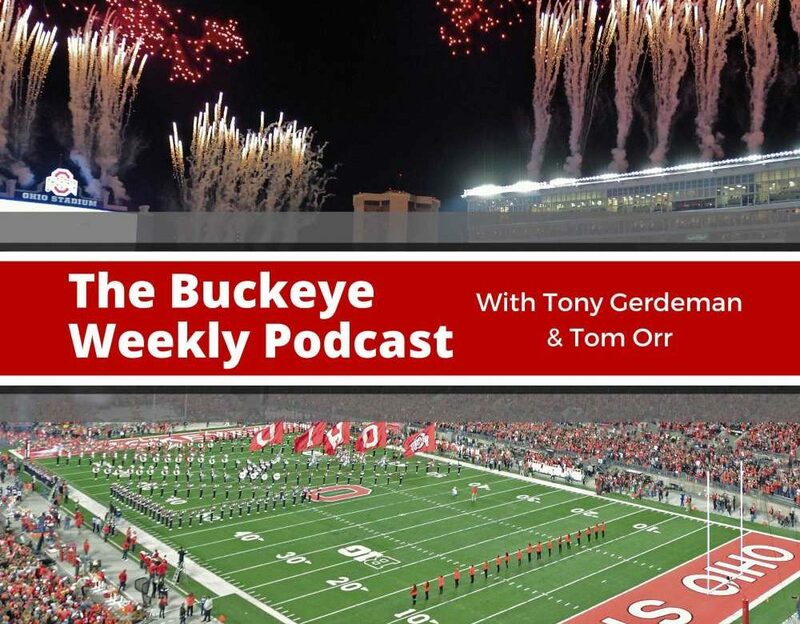 In this episode of the Buckeye Weekly podcast, Tony Gerdeman and Tom Orr talk Ohio State offensive line numbers and the concerns that could arise this season. The topic of a fourth quarterback also comes up, as do the recent transfers and possible transfers. The guys also talk about a potential scheme change on defense for the Buckeyes and how that would work. The show then ends with a bunch of listener questions. + Be careful with the warmer weather. + Kyle Young broke his leg. + Ohio State’s low offensive line numbers. + There are two good solid lines, but what happens if injuries or transfers happen? + Transfers always happen on the offensive line. + If the Buckeyes close with a couple of offensive line signees in February, that would be huge. + More likely that they get both of Doug Nester and Dawand Jones or no? + The increased value of 3-star guys in February. + The Keandre Jones surprise. + He fits the transfer mold, but he caught us off guard. + Tony always knew Tate Martell was going to transfer. + Tony never bought into the Tate Martell hype. + Tom receives his Martell comeuppance. + Martell to Miami makes sense. + Brian Snead is gone. + Some say he was the best RB on the roster. + It’s not a huge loss in terms of numbers remaining. + More zone read will help the running game as well. + Any potential quarterback transfers out there for the Buckeyes? + The fourth Buckeye quarterback likely doesn’t even know he’s transferring from his current school yet. + Could Ohio State be moving to a base nickel defense with a hybrid linebacker/safety? + If so, who is that hybrid guy. + If it’s Brendon White, there will be a ton of other moving parts. + Who else could be the hybrid guy? + It feels like a round peg and square hole with the current defensive roster and looking for a hybrid guy. + The assistant coaches are too busy for the media right now which is bullcrap! + Trying to draw conclusions from random views of practice ain’t easy. + It’s annoying when coaches start closing practices after winning a national championship. + Is the transfer situation this year expected or alarming? + How many preferred walk-ons can a team have and what exactly is a preferred walk-on? + With Parris Campbell and Kendall Sheffield off to the NFL, who are the fastest Buckeyes? + Is there a strong leader on this upcoming offensive line? + Which returning starter won’t be starting in 2019? + Is Matthew Baldwin 100% healthy? + How is OSU’s pro day run and who runs it? + What is the biggest position question mark for the upcoming season.? + Would the Buckeyes have made the playoffs without the Zach Smith situation? + Would Urban still be here without the Zach Smith situation? + What Buckeye football player from the past would you like to see in today’s game? + Pick an offensive and defensive player who is under the radar right now but will breakout this season. + Of the 2019 signees, who plays the most? + How many more guys will be added to the 2019 signing class? + Ohio State’s toughest opponent in 2019 will be? Gerd, do you see any players changing positions to help bolster the Offensive Line? Would think that Hausmann could be bulked up to a guard or one of the nose guards like Cage could add depth in the interior? Not sure how receptive Jerron Cage would be to that, but there is a glut at NT. Of course, two of those guys will be gone after 2019. I think Alex williams could be a guy. He’s got a huge frame and is athletic. August 31st is too far away. That’s true. The built-in excuses shouldn’t be discounted.